One Day Long Ago ……Kermit The Frog came into DerRic’s life. over 200 plus voices by his Teen Years. 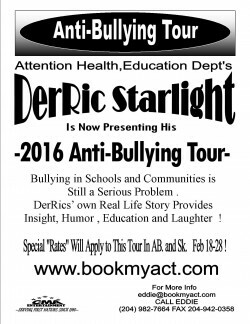 DerRic Starlight was already touring and performing at special events when the decision was made to obtain schooling in the Arts, Media, Theatre, Film Making, Puppet Making and Comedy. DerRic studied in the US at several major schools and attended master classes with some of the finest teachers in the USA. It was then time for DerRic to create his own cast of Puppet Characters. Some of the originals are Granny, Wind Dancer The Jingle Dress Dancer, Marty the lil Gangster Dude, The Warrior Hunter, Band Councilor Willy and more .DerRic has now created over 75 Original Puppet Characters, all with their own Costumes, Voices, and Personalities. After extensive Touring and Travels around the world with his cast of Characters, DerRic started developing stories and comedy bits for use in Television and Film. Today DerRic is poised and ready to Write, Produce, and create Television Specials and a complete Television Series with Comedy and Family Content, Situation Comedy, and Storylines with a Positive message for all Ages and Audiences. DerRic has also appeared on Varouis APTN Television shows such as Beyond Words, Indigenous Circle, The Sharing Circle .CBC TV and Radio. DerRic helped write and Host “The Aboriginal Achievment Awards” with Adam Beach on Global Television and many other networks.